The heritage city of Mysore offers many sights and scenes that can only be absorbed when you explore it from close quarters. An early morning cycle tour of Mysore can help you to discover many forgotten attractions of the city. You can be a part of such an offbeat experience for a small fee. Saddle up to discover Mysore in an exhilarating manner. Mysore is a city with a rich architectural history. The grand palaces and monuments impart a majestic beauty to the old city. But there is another side of Mysore that is equally beautiful, a charming facet of the city that is very different from the much-hyped and often visited local attractions. Life in Mysore thrives in its narrow streets and lanes. Unlike many other cities, Mysore is not a concrete jungle. The rustic charm of the city can only be felt if one takes to explore the living part of the city. The cycle tours of Mysore take you along the alleys and localities of the city where traditional communities lead their lives. The tour leads you to lesser known heritage sites and forgotten wonders of the city. No wonder, such sites and scenes do not find mention on the internet or the travel guidebooks or the tourist maps. Chasing such trails and destinations in the cool breeze of the early morning has its own charm. You can feel the essence of the city as you ride through the empty streets and silent neighbourhoods, some of which are hundreds of years old. The vintage city seems almost magical as it awaits for its residents to wake up and start another busy day. It is this serene beauty that etches a unique picture of the city in the mind of the traveller or explorer. The Mysore cycle tours are guided and you will get to know much about the history, traditions and the lifestyle of the local people. The ride is perfect for those who believe in experiencing a place rather than just visiting the major tourist attractions. The only things needed to be part of such an experience are your ability to ride a bicycle comfortably and an enthusiastic approach. Generally the cycle tours are of 3-4 hours duration and cover around 10-15 km. The tours normally start between 6:00 am to 7:00 am. Some cycle tours are organized only in the weekends while others are organized daily. If you are visiting the city with kids and want to enjoy the Mysuru cycle tours, talk to your tour organizer first, since some tour organizers do not allow kids on such cycle tours. 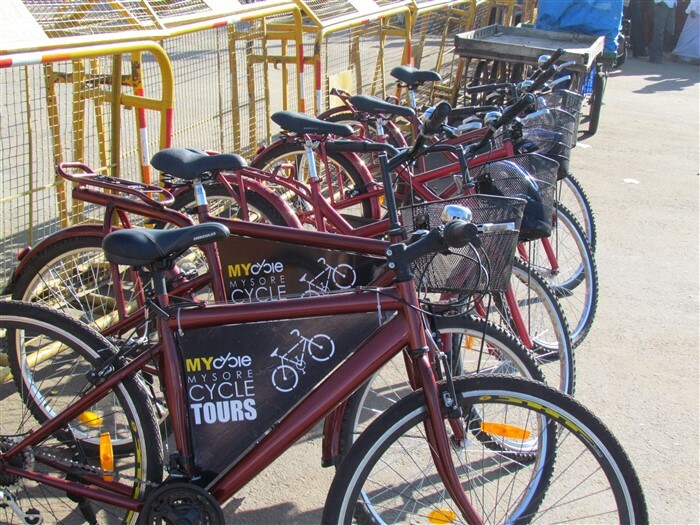 There are quite a few tour organizers and private travel guides who offer Mysore cycle tours. There are a few things that you must remember as you buckle up for a breezy ride along the streets of Mysore.